Okay, well you heard about our trip there. We arrived at the Melbourne house (which was gorgeously spotless, thanks Bryan/DJ), and everyone was watching Barack and Jay Leno except DJ and I, who caught up a bit. After Jonathan's parents left, the five of us (JB, myself, Joe, Bryan, and DJ) headed to Steak & Shake, as we were crazy-hungry from the aforementioned flight. We were all pretty sure that the server was high, but the only employees present were teenagers, so there wasn't much we could do about it. I ordered the same thing I always do, the breakfast bagel combo. Only this time I ordered it with a vanilla milkshake instead of a hot chocolate... which meant he should have charged me an extra $2 or so to cover the beverage difference. But instead he charged me for the "large combo" instead, which I think saved me a dollar? Joe and JB each ordered the slider-special, meaning one of each of the sliders (5 or 6, I forget). Of course we were up late, but a lot has happened in the past two-and-a-half months, so it was good to talk. The next morning JB and I needed to go to the bank (Bank of America's customer service is only helpful if you're IN the state in which you created your accounts, FYI). I went back to the house to get some work done and switch out some items from my suitcase to the house and vice-versa. JB went to have lunch with some of his old coworkers from the Cape. I was starving by the time he called to say he was on his way back, and asked him to pick up something for me. He mentioned he'll be passing a Wendy's, so I ask for a caesar side salad and a 5-piece nugget. 35 minutes later he walks in the door with a #1 from Chick-Fil-A and a lemonade. This here demonstrates how well he knows me, as I was so happy with this surprise I burst into tears (marking the first time I'd done that out of happiness since we got engaged four years ago). I enjoyed my lunch thoroughly (remember we don't have Chick-Fil-A here in Cali), then drove JB to the gym to meet Ebad for racquetball. I didn't see him again until the next morning, so he'll have to fill you in on his day. The drive was very strange, since they've finished the Florida Ave corridor while we were gone (and it certainly looked like it would take much longer when we last saw it). If you're heading north on Hollywood, there used to be a light at Eber, then a four-way stop at Henry, and then a light at US-192. Now, between Eber and Henry, there's two more lights, one at Florida Ave (which cut to Dairy) and one 100 yards later at Westbrook. There's no real reason for the second new one, but Florida Ave sure needs it. It makes getting from our house to FIT a lot faster, but otherwise there's not a heck of a lot you can do with that corridor, except alleviate traffic trying to get to another major place like Palm Bay Road. I then went shopping at Ross (I haven't shopped in FOREVER) and picked up a dress and a polo. After that, I headed down to Vero to hang out with BK. Traffic was nuts, and when I reached the agreed meeting place, BK was ready to move on, as there was a steel-drum-band concert in the park. His friend had told him about it, so we headed out, kinda like the blind leading the blind, since I only kinda knew how to get to Riverside Park from the US1 and SR60 area. I got to 53rd and US1, and it was clear I had done something wrong. We pulled over and BK phoned his friend. Turns out the concert was at Rivergate Park, not Riverside. Since Rivergate is in Sebastian, we decided to go to Abbott's instead. I've probably suggested it to BK five times since he moved to Vero, but he still hadn't been. And frozen custard is my FAVORITE dessert. It's hard to come by, so I was looking forward to it. I only had a small dish of vanilla and chocolate (planning for a fun fair meal later), but BK tried one of their sundaes. We caught up on a lot, especially since he's a first-year teacher and that's a rough industry right now in Florida. From there we met up with Tori at Target, and carpooled to the Indian River County Firefighters' Fair. 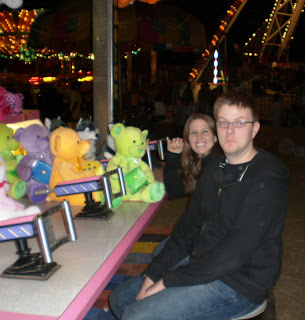 None of us had been to this particular fair before, and it was really... bad. The food was way more than it used to be (comparing this to the St. Lucie County Fair, South Florida Fair, and North Florida Fair), which was annoying. Tori and I shared a funnel cake with powdered sugar, and a Sprite (but we're pretty sure it was really 7-Up). Tori and BK played one of the games where you aim your squirt gun at a target, but both lost. We almost paid to see one of those crank exhibits - the snake woman - but I refused on principle. There's all these signs that say "Special - 50 cents today!" but when you actually go up there, the man says that it's 50 cents for children, and $1 for adults. I mention the sign, he shrugs and says it's only "for kids." Tori points out false advertisement, but you can only argue so much with a carny. Tori wanted to pay the full dollar and see it, but I was rude to the man and we left. We also saw a hypnotist show, which was mildly amusing. Most of the volunteers were teenagers, so at least it wasn't racy. We ended up staying at the fair almost three hours, which was really surprising when you consider that we didn't even go on any rides (let's not even start about those prices now!). Then, back to Target so we could get our cars and meet up for Phase 10 at BK's house. But first, a stop at Wendy's since we hadn't eaten the planned sausage-peppers-onions that is our (Tori and myself) typical fair food. We did some parking-lot circling, BK went to a closed Starbucks, and we met up again at his place. We proceeded to play Phase 10 until after 1am, when I won. I headed home shortly after.